The American Optometric Association states that more than seventy percent of employed persons that sit daily from a computer screen (around 143 million ) experience computer vision syndrome (CVS) or eye fatigue. Excessive computer use can result in eye stress and impact eyesight in kids as well as adults. Anyone that spends over 2 hours on a daily basis at computer is at risk of some degree of CVS. Computer eye fatigue and CVS result from the need for our visual systems to compensate for viewing characters on a digital screen differently than they do for characters on a page. While our visual systems are used to focusing on printed content that contains dense black characters with sharp borders, they are not as adept with letters on a computer screen that lack the same level of clarity and definition. Characters on a digital screen are formed by pixels, which are most luminous in the center and dimmer as they move outward. Consequently, it is more difficult for our eyes to focus on on these characters. Rather, our eyes feel more comfortable at the ''resting point of accommodation'' or RPA. Our eyes involuntarily revert to the resting point of accommodation and then have to make a great effort to regain focus on the images. Such continuous flexing of the eyes' focusing muscles creates the fatigue and eye strain that commonly are present during and after use of a computer or digital device. Computer vision syndrome isn't a matter of concern just for those who spend a lot of time on computers. It's important to note that other digital gadgets such as smart phones or iPads can result in similar eye fatigue that can be in some cases more severe. Because the screens on handheld digital devices are often small the user often strains even more to read text. If you are at risk for computer vision syndrome, you should consult an eye care professional as soon as possible. At a computer vision exam, your eye care professional will perform tests to detect any vision issues that could contribute to computer vision syndrome. Depending on the results of these tests, your optometrist may recommend prescription computer glasses to reduce discomfort at your screen. Additionally, you should strongly consider an anti-reflective coating for computer glasses. An anti-reflective coating eliminates reflections on the front and back surfaces of the lenses that cause glare and interfere with your ability to focus on images on your computer. Visual Ergonomics, or changing your computer workstation to reduce strains in vision or posture, can help reduce some of the discomfort of CVS. Sufficient lighting and frequent breaks can help to some extent. Nevertheless, since ergonomics alone cannot solve problems with vision, wearing prescription computer eyeglasses is also required. 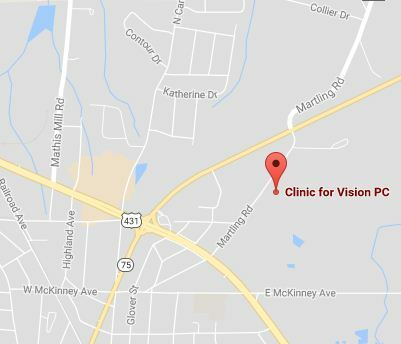 If you would like to speak to a professional eye doctor to discuss the signs and treatments for computer related eye strain, contact our Albertville, AL optometric practice. Findings from the American Optometric Association indicate that over 70 percent of employed persons that sit for the majority of the day from a computer monitor (which is over 140 million people) suffer from computer vision syndrome or eye fatigue. Excessive periods of working at the computer can result in eye strain and impact eyesight in children as well as adults. Anyone that works more than 2 hours on a daily basis on the computer is at risk of suffering from symptoms of computer related eye fatigue. Signs of Computer Vision Syndrome include vision difficulties such as dry eyes, blurred vision, inability to focus or double vision and muscular pain such as headaches, back pain and heavy eyes. If you are experiencing a number of these symptoms you may be suffering from Computer Vision Syndrome. Computer eye fatigue and computer vision syndrome are caused by the need for our visual systems to adapt to processing letters on a digital screen differently than they do for letters in print. While our visual systems have little problem keeping focus on printed material that contains solid black font with clear borders, they have more difficulty with characters on a digital screen that don't have the same degree of clarity and definition. Words on a computer screen are composed of pixels, which are brightest in the middle and dimmer as they move outward. Therefore it is harder for our visual processing center to maintain focus on these characters. Rather, our eyes reduce focus to the ''resting point of accommodation'' or RPA. Through involuntary movements, our eyes revert to the RPA and then have to make a great effort to focus on the screen. This continual strain on the muscles of the eyes to focus results in the fatigue and eye strain that sometimes occur with extended computer use. Computer vision syndrome isn't a concern just for those who spend a lot of time on computers. Other digital devices such as mobile phones or tablets can result in similar symptoms and in some cases even worse. Since handheld screens are smaller in addition to pixilated the eyes have to put even more exertion into focusing on the images. Computer vision syndrome can be extremely draining so if you are experiencing discomfort it is worthwhile to see an eye doctor as soon as possible. At a computer vision exam, the eye care professional will check to see if you have any particular vision problems that might contribute to CVS. Depending on the outcome of these tests, your practicioner may prescribe prescription computer eyeglasses to help you work more comfortably at your computer screen. Additionally, you should strongly consider an anti-reflective coating for computer eyeglasses. Such a coating eliminates glare that may affect your ability to focus on images on your screen. Visual Ergonomics, or setting up your workstation to reduce the need for your eyes and your body to accommodate in unhealthy ways, can help reduce some physical symptoms of computer vision syndrome. A well lit work area and taking periodic breaks from staring at the screen will cause some relief. However, since ergonomics alone cannot resolve problems with vision, wearing prescription computer eyeglasses is also necessary. If you would like to speak to a professional eye doctor to find out more about the risks and treatments for computer related eye strain, contact our Fayetteville, NC optometry practice.